maintain the health of the community." The photo & text can be found on the Arizona-Sonoran Desert Museum website. The scene is actually an area where I use to live in the San Jacinto Mountains. The thinking expressed above parrots the historical conventional flawed wisdom and policies of how US Forest Service being advised by Biologists (who should know better), have mismanaged the natural resources or at least what is left of them with this old outdated archaic viewpoint about Chaparral. Old growth Chaparral is truly a forest ecosystem of it's own. Hence the term Elfin Forest. Chaparral has an incredible ability to help soil to retain massive quantities of water and actually facilitates the percolation of water deep into the earth. Hmmmm, just like any other type of old forest does. On a later post I'll show that Chaparral also aids in cloud formation, as do most various forested ecosystems around the globe. At this point I need all readers, many of whom are from various countries around the globe to pay close attention to several of these posts because I hope to help others gain some insight as to how they too can bring about any habitat restoration by actually observing what really goes on in nature and dumping many of the flawed conventional thinking of Big-Business influenced science based technologies which has brought us the unhealthy natural world we all presently live in.On a later post I'll show that Chaparral also aids in cloud formation, as do most various forested ecosystems around the globe. With this subject of proper restoration efforts mimicking nature in mind, let me jump here for the moment to an organization dedicated to education of of the average citizen to the California chaparral plant community and it's extreme health and importance to the planet in this region of the world. At this point, let me draw your attention to a series of photographs taken by Chaparral Institute Director and Biologist Richard Halsey which illustrate some of the failed policies and techniques of many of the modern day reforestation projects using outdated old school thinking in habitat restoration. In 2003, San Diego County, California experienced one of the worst gross human error caused wildfires ever to happen. 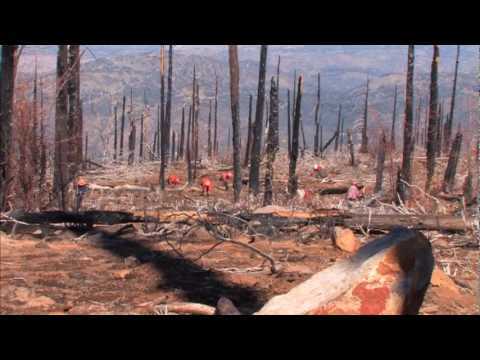 The conditions under which the fire was started were un-natural in the sense that normally such natural lightning caused fires never start under such conditions on their own in nature. The Santa Ana wind conditions have worsened as time has progressed. Clearly there may be a climate change reason for this, but that isn't the discussion here. When the winds shifted from the northeast pushing flames west over the ocean, the shift to onshore flow from off the Pacific Ocean pushed the fire back onto itself and pushed it east into the Cuyamaca State Park. This park always reminded me of the Yosemite of Southern California for it's natural beauty and wildness. That all changed as a result of this fire which chewed up almost 100% of the park. That takes us to the years after the fire with restoration efforts and the photos below. Everyone understands how devastating such a forest fire is and the heart felt need for wanting to put it all back together again. But there are clearly rules in nature for following certain protocols of natural progression that should be respected. 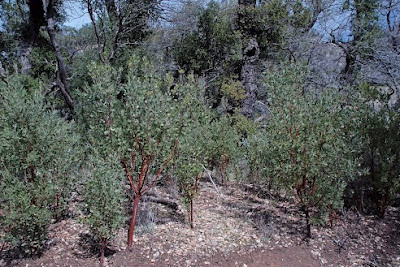 Take a look at the mistakes in clearing the Chaparral like Scrub Oaks, Manzanitas, Mountain Mahogany, etc which are mistakenly viewed as villains in the restoration process. Nothing is further from the truth however when it comes to keeping the health of the mycorrhizal networked grid intact, alive and functionally serving it's customer base. There's nothing like outdated thinking of clearing imagined invasive chaparral which competes and blocks out sunlight for conifer seedlings. I'd expect such thinking from the forestry workers/laborers, but not the Biologists who are responsible for the design and set up of these reforestation projects. 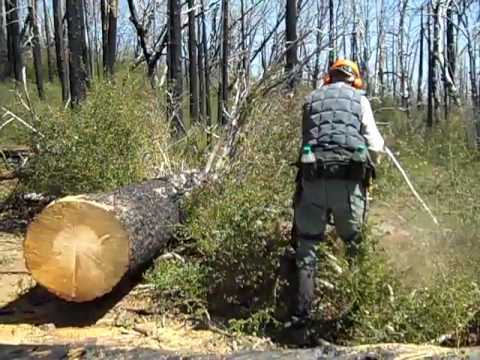 Below is the stump of an old growth Manzanita deemed unfit and an actual hindrance to forest rehabilitation. And the following pictures are of the Manzanitas before they were removed as it was deemed necessary to the survival and success of the conifer seedlings. - UNBELIVABLE! Notice the long leggy looking pine trees in the above photos which the experts believed they were doing a favour by removing all the chaparral ? Incredibly it was the chaparral which was foundational support of these seedlings which by the way were of the natural seeding after the Cedar Fire. These photographs are provided by Richard Halsey of the California Chaparral Institute. It'll be interesting to see how the seedlings respond. 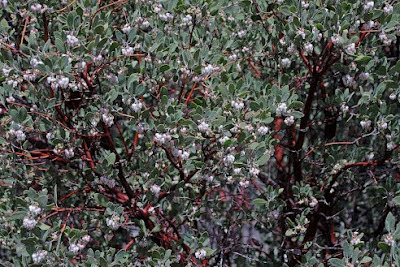 The other thing not considered here is that the Manzanita and other Chaparral were also another important food and nesting source for the wildlife which was also displaced by the fire. Take another hard look at those leggy looking pine trees in the above photos which the experts believed they were doing a favour by removing all the chaparral ? What flabbergasts me is that such thinking would come from biologists who in this day and age would actually believe this removal was necessary. This area has high winds and the chaparral acts as a sort of natural support staking apparatus along with it's mycorrhizal grid health management mechanisms. The trees are now exposed to high winds without this support and it originally was the chaparral that kept the mycorrhizal grid network alive and functioning. Trees will often take a while to skyrocket in growth through this canopy. Often what they are doing in their young life is developing a strong root and tapered trunk support system. Once they reach a certain age and conditions are right, the genetic instructions will trigger and messages sent for explosive growth as I have personally observed on Rattlesnake Mountain in El Cajon with the Torrey Pine colony and my own former property where after a decade of seeming slow shrubby growth , the trees fire like a missile through the chaparral canopy. Have a look at what famous Austrian Forester Viktor Schauberger had to say about allowing slower progressive growth of forest trees under a shaded canopy of which he uses the term Mother Trees. Take the time to read Swedish Author - Olof Alexandersson's book "Living Water" and the specific chapter on Viktor Schauberger's views on proper custodianship of an old growth forest. Schauberger was from a family of career Professional Foresters from Austria and himself was a forester for the Austrian Forestry in the early 1900s. Though most of his life's research was on the vital energetic health of water, it was the proper health of forests which accomplished this work. The quotes from the book below were printed here in Sweden and by Olof alexandersson's own hand. He was an assistant to Schauberger in the last years of his life until Viktor's death in 1958. Still his views are amazingly ahead of his time. "Viktor Schauberger saw the forest as the prerequisite for healthy water, for a sound build-up of nutrition, and for maintaining a sound human culture. The definition of the term 'forest' was for Schauberger totally different from that used by modern commercial forestry. Schauberger's 'forest' is a naturally mixed forest, with many species coexisting in ecological harmony. He wrote in 1930:A healthy forest, untouched by forestry technology, is made up of a strange mixture of vegetation. Alongside well defined areas of noble trees, conditions of apparent chaos can be found, which can best be described as irregular confusion. People who are not aware of the importance of the balance in Nature, of which the forest is a part, want to clear areas of everything they do not consider to be useful. A great deal of sensitive concern and observation is necessary to begin to understand why Nature depends on an apparently chaotic disorder.Modern forestry is completely unrelated to the forest's natural life, but, instead, upsets the whole balance of growth and creates chaos.At one time the young sapling lived for decades in the healthy naturally-growing forest, uninfluenced by man and his technology, as part of the healthy growth protected by the mother trees and responding to the harmonious balance of temperature, humidity and light. the direct influence of the sun except for the crown. The commercial forester, aware of the effect of light growth, envisaged a scientific method of achieving the same results. no disadvantage, because it avoided the necessity of draining this type of ground, which was of no value. methods of arboriculture, the highest quality wood, the so-called 'resonance wood' has disappeared completely. even a scientific breakthrough, has since been revealed as a calamity. Perhaps it is too late to avoid cultural decline as a result of our mistakes. It is clear that the extermination of a type of tree creates a gap in the ecological balance because its destruction can lead to the disappearance of another type. no disadvantage, because it avoided the necessity of draining this type of ground, which was of no value." methods of arboriculture, the highest quality wood, the so called 'resonance wood' has disappeared completely. for his famous violins) shows that it is not only healthier, but also has an almost unlimited durability. In comparing the development subjected the saplings to too much light and warmth and an excessive growth of the annual rings. 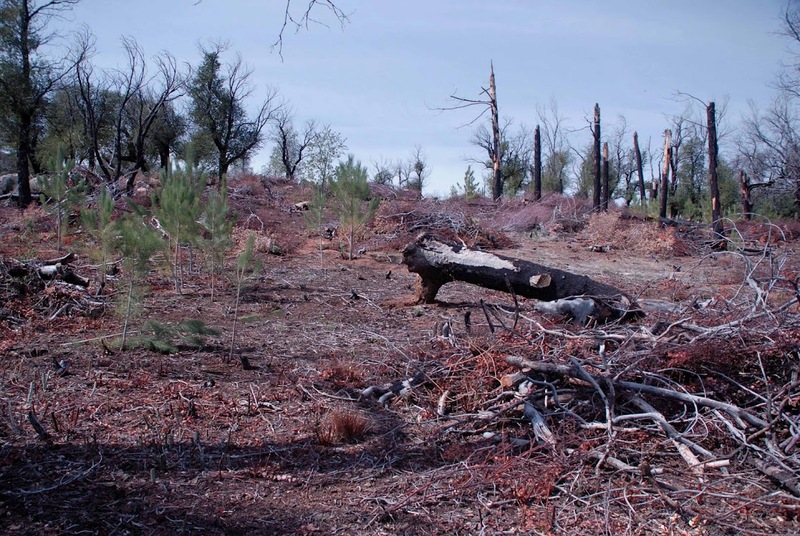 These new methods have resulted in the system of laying waste whole areas of trees. As a consequence, certain forms of undergrowth have disappeared. This was thought to be of no disadvantage, because it avoided the necessity of draining this type of ground, which was of no value.Inevitably, this new form of timber industry has left those trees standing which grow in the shade and thus are light sensitive, without the protection of the old trees vital for the natural rejuvenation processes. The centimetre-wide annual rings on fir trees, caused by the sudden denuding of other trees in the immediate vicinity, produce spongy wood of inferior quality, and after cutting it is evident from the rings that there is a loss of consistency. After the drying-out process, these spongy areas contract in a different way to healthy wood. Clearly, such wood should not be used for house construction. Since the introduction of scientific methods of arboriculture, the highest quality wood, the so called'resonance wood' has disappeared completely.This slow growing wood differs from the fast produced by modern methods by the annual rings, which are difficult to distinguish. The organic structure of the natural woods hows a fine homogeneity. The wonderful timbre of the instruments made from this wood (which Stradivarius used for his famous violins) shows that it is not only healthier, but also has an almost unlimited durability. In comparing the properties of wood produced by modern forestry practice with this wood of supreme quality, one begins to realize the almost irretrievable loss we have suffered through blatant misunderstanding of natural processes.One might ask how can we continue to use a forestry technique, which after barely a century has been responsible for such catastrophic results, jeopardizing the future of all forests? A return to Nature and her processes is now becoming increasingly urgent The forest is not a resource to be exploited, but a vital organic part of each culture,particularly in the mountain regions. Social deprivation becomes greater as a consequence of today's destruction of the forest. What at first sight appeared as a great source of wealth,even a scientific breakthrough, has since been revealed as a calamity. Perhaps it is too late to avoid cultural decline as a result of our mistakes. It is clear that the extermination of a type of tree creates a gap in the ecological balance because it's destruction can lead to the disappearance of another type. This has the effect of reducing the supply of deep ground water and its accompanying nutrients. 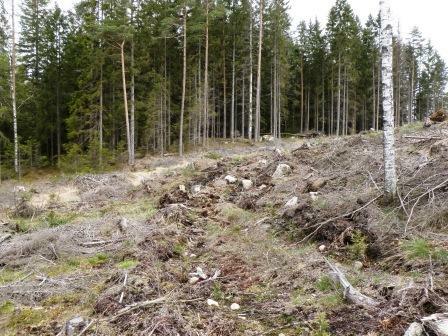 The timber needs of our modern construction industry has led to the clear felling forestry economy with its forced replanting methods, resulting in a general decline in the quality of the timber.The disturbance of the forest's natural balance has also far reaching consequences as the whole nutritional supply for the surrounding landscape is seriously damaged.As a result of the wholesale clearance of forest areas and the dying out of certain types of wood, the soil starts to lose nutrients. The sun's rays are now able to reach the soil surface, causing it to warm up. This means that the groundwater containing the essential nutrients is prevented from rising, and the vital salts are deposited below the root level of the saplings. The roots can no longer reach the nutritive layer deep in the soil. 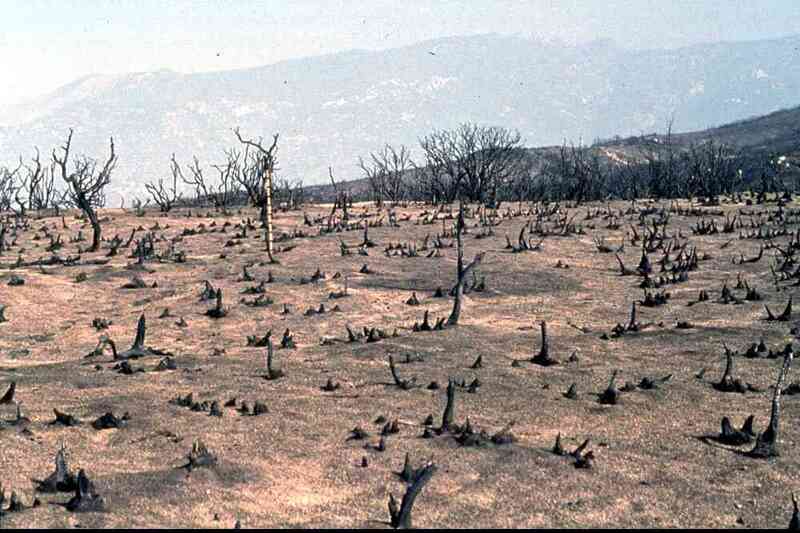 Soon the vegetation will diminish and the decline to desert waste begins." Schauberger points out that a natural forest has an average temperature in the root zone of +9°C. This temperature must not increase if the natural growth process is to continue." "Schauberger emphasized that the natural forest is a power centre for the whole of the surrounding landscape. He sees each tree as an energy-laden body in which a number of complicated processes occur, and which radiates energies into its immediate environment. These energies, 'horizontal ground rays', which also emanate from natural watercourses are not only a basis for vegetation growth, but also help build up ground water.The damage caused by modern forest technology is so devastating, because this energy interchange cannot evolve as it does in a natural forest When there is a variety of tree types and undergrowth, energy is created in the whole forest area Schauberger also stresses the important role of trees as mineral processors, building up metals and minerals, through biochemical reprocessing and biodynamic circulation:Each green leaf or each needle is in effect a remarkably well regulated metal factory. Its operation can be demonstrated experimentally. With the falling of the leaves or needles this supply of metals is scattered by the wind, and the more undergrowth there is, the greater is the dispersion of organic metal salts, which during the winter are pressed down hard by the snow.14 These metals play a large part in the build-up of the'insulating skin' that Schauberger thought so important for the living processes within the soil. They form an extremely fine material lattice on the ground surface, a type of organic diffusion filter that separates the negatively-charged ground from the positively-charged atmosphere, a prerequisite for the growth process.In this way, the trees build up important metals needed by plants and man, particularly in the form of trace elements. The water course flowing out of the natural forest carries with it some of these metals and deposits them in the surrounding environment These trace elements contribute to the basic make-up of living water.Besides its well-known ability to ameliorate the climate, the forest has also, according to Schauberger, a series of vitally important functions. He calls this the 'water's cradle', a vital factor in the provision of ground water. It produces trace elements and minerals, and it creates energy to make nutrition available." "Viktor Schauberger was certainly one of the first in the world to warn about man's encroachment of the natural forest. His bitterness and worry about the plundering of the forests that commenced after the First World War in Austria and Germany was expressed movingly in his speeches and writings. He entreated the authorities, in his attempt to awaken public opinion to this 'final sale' of the landscape. He wrote in 1928:What can be said about the forest and its life? Unfortunately,my task is to write about its death. It is vital to alert those men who are still in a position to save the dying forests from the hands of those who have no feeling for, or awareness of Nature.When a man dies the bells toll. When the forest dies and with it a whole people perishes, not a finger is lifted. It is known that for the death of a people the death of a forest has preceded it.It may be hundreds of years before the forests return to the same standard as they were a few decades ago.The general public is not aware of this slow decline of quality. People see forests everywhere and are deceived by statistics, which report that there is more timber produced per hectare today than previously. 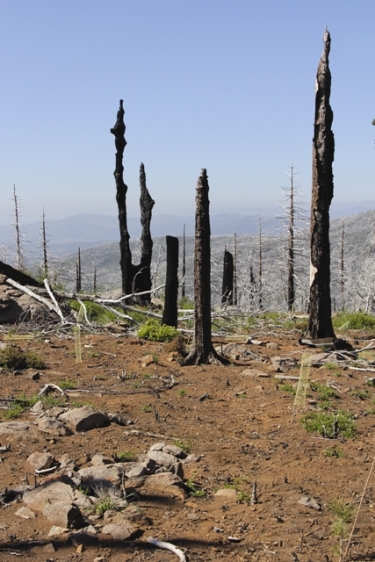 This merely conceals the real truth - that the quality of the remaining forests is declining at a frightening rate.He had learned from bitter experience that the destruction of prime forests led also to the disappearance of water. In 1930 he wrote:The finest memorial which could be given to a man, would be if he had the power and the will to end this senseless destruction of the timber forests. Tragically, the significance of the forest in relation to the life of a people is not appreciated in anyway. The forest is both the cradle and the haven for the divine water, if man destroys this haven then the water becomes resdess and of the greatest danger.Without the forest, no water, without water, no bread;without bread, no life.One eventually comes to the conclusion that all today's failures derive from the mistakes which have taken place in the ground, in the water and in the air.It is not a question of the forest remaining unutilized by man; but present methods make no sense and display a total ignorance of the laws of forest and water.So long as a waterway is able itself to transport a log, the forester may use his axe. The deterioration of a waterway is a warning of danger, which, without exaggeration, threatens our very existence.So long as the forester does not interfere with the natural order of the forest, the stream, which flows through most forests, will deliver almost without cost the fruit of the forest, namely, the timber.If, on the other hand, the forester (in this case, a forest destroyer) so operates that he changes the basic concepts under which the forest can thrive (by, for example, wholesale timber felling), then Nature will react to protect itself. The destruction of the forest leads immediately to the destruction of the waterways, the only profitable means of transport.The wholesale destruction of forests continues and everywhere the consequences are frightening. The sinking of the ground water level, catastrophic flooding, irregularities of precipitation, agricultural decline, - all this and more are the consequences of mismanagement Man has introduced the crudest possible methods of tampering with Nature's self-regulation without the remotest knowledge of how the natural order properly functions, or of the laws of natural movement. There is complete ignorance of the relationship of the forests and vegetation to fertile soil, which is in fact so similar to that of the skin to the human body. Man puts a tremendous effort into developing a forest, with the sole purpose of exploiting everything that it contains, even though its price is the total destruction of the forest environment The most astonishing fact however, is that despite all the evidence of malpractice and economic decline, the irresponsible methods of forest treatment are still in use, which inevitably means destroyer) so operates that he changes the basic concepts under which the forest can thrive (by, for example, wholesale timber felling), then Nature will react to protect itself. The destruction of the forest leads immediately to the destruction of the waterways, the only profitable means of transport.The wholesale destruction of forests continues and everywhere the consequences are frightening. The sinking of the ground water level, catastrophic flooding, irregularities of precipitation, agricultural decline, - all this and more are the consequences of mismanagement Man has introduced the crudest possible methods of tampering with Nature's self-regulation without the remotest knowledge of how the natural order properly functions, or of the laws of natural movement. There is complete ignorance of the relationship of the forests and vegetation to fertile soil, which is in fact so similar to that of the skin to the human body. Man puts a tremendous effort into developing a forest, with the sole purpose of exploiting everything that it contains, even though its price is the total destruction of the forest environment The most astonishing fact however, is that despite all the evidence of malpractice and economic decline, the irresponsible methods of forest treatment are still in use, which inevitably means that the forest as the basic requirement of every culture, is doomed to die ...Even though this was written in the 1930s, it has a burning relevance for the 1980s.At a time when millions of men are unemployed and miserable, the forests should be built up again with their waterways and storage lakes, so that the right balance is restored. Then the streams would once more supply healthy water. Such a scheme would get rid of idleness,which has already resulted in severing all relationships with Nature, and is literally the last hope for rehabilitation. Schauberger sees the natural forest as the base for all the build-up of quality of water and nutrition. If the natural forest is destroyed, natural biological water is first affected, and,then, the build-up of all other organic material. The biological quality of the nutrition is diminished, and people become more and more vulnerable to illnesses stemming from deficiency,circulatory diseases, and finally cancer. This, for Schauberger, was the logical consequence of the disruption of the forest's and the water's natural processes. Thus, the husbandry of the natural forest is a question of the survival of mankind:Without a healthy forest, there can be no healthy water, no healthy blood. It follows from this that resulting from the present methods in forestry and water management, a deterioration of the fundamental quality of living takes place. Schauberger had seen with his own eyes how the destruction of a forest region quickly led to biological changes. He relates one of his experiences: in Salzkammergut there was a spring considered to be poisonous. It had been enclosed to prevent grazing animals drinking from it Schauberger came to the place in the company of an old gamekeeper, who warned him not to even approach the spring. Schauberger's dog, during an unguarded moment, drank from the water, and after an hour's lapse was still full of vigour. This prompted Schauberger to himself have a drink. At first he felt dizzy, but his sensation soon gave way to a noticeably refreshing feeling. He explains:In the vicinity of the spring, traces of the presence of mountain goats were found. Surrounding the spring were mountain plants, which left an oily film on our mountain boots, which also could be seen on the surface of the crystal clear water.Particularly striking was the blood-red colour of the Alpine roses. They surrounded the spring like a blood-red carpet The leaves of these roses were as if sprayed with gold dust, which under the magnifying glass were found to be scales. There was undoubtedly a metallic content in these leaves.The water here did not freeze during the severest winter,where, at this altitude, minus 30°C was not uncommon.The old hunters set their fox traps at such springs. They were covered with moss and thus not exposed to light. They 74 LIVING WATER never froze, and kept the bait soft and odourless. The colder the external temperature, the warmer was the water. With an air temperature of -30°C, the water temperature rose by 10°C, while on a particularly hot summer's day, it always approached the 'anomaly' temperature of +4°C.This took place just before the First World War. During the war, a depth of about 600 to 800 metres of forest was cut down. In the following spring, the spring already began to dry up. The oily film, mentioned above, completely disappeared.The water became stale and first the medicinal crops in the vicinity disappeared, then the short grass, of which the goats were particularly fond, died off.Suddenly mange appeared in the area, which hitherto had been completely free of this disease, and gradually all the goats fell victim to it. Goats only survived if they did not stray from the springs or from where no wholesale timber clearance had taken place.It was through systematic and thorough observations of this kind, that it can be shown that water cannot rise high and the inner growth cannot be stimulated, if the heavy metal matter begins to fall out because of the weakening of the earth's strength through excessive timber clearance.Due to timber clearance, the metallic types of medicinal herbs can no longer thrive. The goats cannot regenerate their blood, through the crops which are necessary for them at these altitudes. Schauberger meant that, in the long term, mankind would be affected by the uprooting of forests, in the same way as the mountain goats. Viktor Schauberger's understanding of forests can be summarized as follows:1) The forest must not only be thought of as a source of raw materials and a base for material well-being. At the same time as being a vital life source for water and the fertile mouldy soil, it also generates energy and builds up a vital environment even beyond its boundaries. It is the cradle of living water.2) Without a natural forest, where many species of trees,bushes, and herbs are allowed to grow naturally and inter-relate both above the ground and in the root areas,the full cycle of water will not be properly completed.This is necessary in order to bring up the salt nutrients and trace elements to fertilize the mouldy surface soil.3) Without natural forests, water cannot flow from springs and streams when it has matured within the soil, and it cannot then continue to develop and fulfill its natural functions on the surface without the forest cover.4) A natural forest is like a power centre that sends out energy in flowing water to the surrounding environment. 5) The so-called rational forestation with its method of plantation, thinning and clearing, disturbs the complex relationships upon which the quality of all living organisms depend. Such forest exploitation becomes a threat to mankind itself, through its biological degenerative effect on water and foodstuffs." "Viktor Schauberger, together with his engineering son Walter,founded an organization in Austria in 1951 to encourage the protection and regeneration of natural forests, and promote environmental protection in general. This organisation, The Green Front (Die Grune Front) found a wide appeal, and it was in no small measure due to its work that responsible authorities in Austria finally woke up to the fact that the destruction of forests must cease. At the Forestry Charter Meeting in London in 1951, the two pioneers of The Green Front were praised for their contributions." 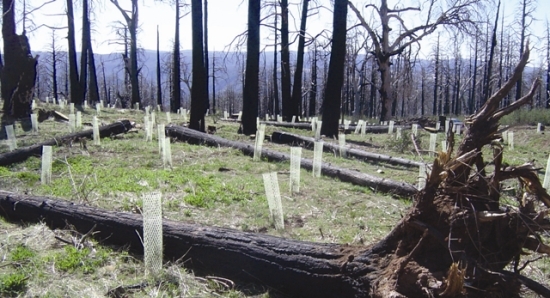 Now take a look at some of the reforestation efforts on Cuyamaca State Park. Note the characteristic way in which most reforestation projects proceed. Mostly in the United States when you are talking reforestation, what is meant is nothing more than monocropping of Conifers (multiple species of pines, firs, cedars, etc) plantings only. The multi-species vegetative healthy mix of various species of plants that Viktor Schauberger spoke about and that can be viewed by observation in nature is for the most part never considered. I was up there on North Peak in the Cuyamaca Mountains with my brother at his friends house not long after the 2003 Cedar Fire. I remembered the ground being green like a lawn. On closer inspection you could see most of this were tens of thousands of Incense Cedar seedlings about three or four inches high. There were of course various other trees and plant seedlings in the mix and that is the way it was supposed to be. The ground gets covered very quickly after the following years rainfall season ends. 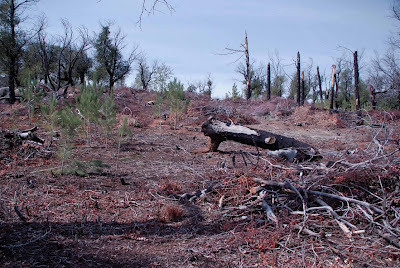 Take a look at what most of the forest should look like without the human error inspired chaparral removal programs. Now when you really look and meditate on what you are looking at above, you'll realize that the engineering which drives the natural ecology's objective is programmed for the system to quickly cover the land. The life there doesn't compete in some Survival of the Fittest mythology game. These various species of plants are actually helping each other out through the still existing mycorrhizal network to survive and until some government advising Biologists actually get this through their thick ideologically philosophically driven skulls and starts replicating the reality found out there in nature, then the continual failure after failure will be the order of the day until the natural world becomes depleted of any vital energy to replace itself. Nature doesn't care about competing political entities striving for worldview dominance. It becomes easily and equally bastardized by all sides of the issue. YES - I understand the heartfelt emotional want and desire of having things back the way they once were, but the reality is it will take 100s of years if not 1000 years to properly become what it once was. In the mean time there is a waste of taxpayer monies and resources where it could be better spent elsewhere, but that's for other people to try and change who actually believe any government on the planet will actually pay attention and do the responsible thing. I've got more to write about on exactly what Viktor Schauberger was referencing with the need for slower growing of trees under the shaded canopy of what he termed Mother Trees for a stronger forest. Keep in mind that the man had a golden opportunity to study a healthy natural world in it's pristine natural state. For most of us today we DO NOT have that kind of privilege. But for the moment I'll stop here and leave it for a part two in this series. Please pay attention and read the link from the California Chaparral Institute and Join the non-profit organization with it's very in depth educational system and on site resources. It doesn't matter what part of planet Earth you live in, because the information found there will actually promote and insightful inventiveness or creative ideas on dealing with restoring your own homeland ecosystems using the basic principles taught from it's pages on that site. Please also take the time to read Olof Alexandersson's book "Living Water"
This is a serious paper, not a blog post...very detailed. Relevant even here, far from So Cal chaparral, in it's mindset...vs. the mindset by those who think only part of nature belongs (pretty forests), while other parts do not (ugly, stickery chaparral). 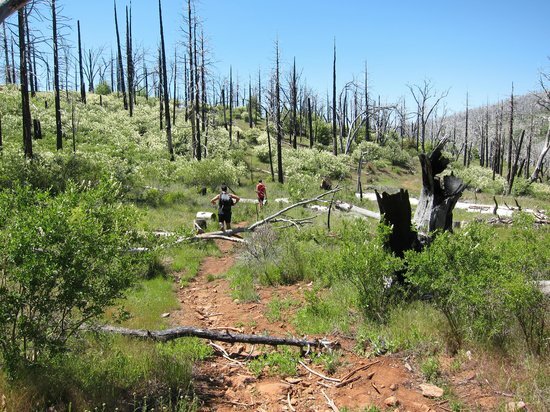 We have those here who want to eradicate most creosote bushes and other desert plants, since to them, arid Abq and even Las Cruces "was once" grassland and not desert. To them, prairie is the climax species. Others deny native plants in our own area, ultimately, since they don't want to admit they moved to the desert. Back to the topic, chaparral is one component that seems to fulfill the nurse plant role to the other species, as they move around over time as shade develops, etc. Not to mention the soils under them is probably critical to everything else. Thanks, I've been frustrated so often by some of the nonsense policy making by forestry (State & Federal) Counties, Cities, etc whose ignorance dooms them to failure and ultimately runs up the costs. This trickles down to the average gardener, landscaper, or just volunteer nature enthusiast. If folks could actually get a real world feel for how things work and that they are not so unintelligent as made out in the classrooms, then there may be a fighting chance. Viewing nature as a bundle of rediculous stroke of luck compromises is plain idiocy. The flawed programs and policies clearly reflect this flawed thinking at work. It's irrelevant how one believes it all originated in the short term because all that is necessary is learning how all thsee sophisticated componants work in harmony with one another in an orderly fashion and with just enough randomizing to make it interesting. Part two and other drafts soon.